Ron Lucas is an autodidactic, former factory and warehouse laborer. He was born in kendallville, IN, raised in the rural, Appalachian mountains of South Eastern, KY, and attended Morehead State University. He lives in Fort Wayne, IN and spends the harsh Midwestern winters in Atlanta, GA with his eldest child, an Emory University alumnus. His poetry has appeared in various publications for decades. This is his first collection. 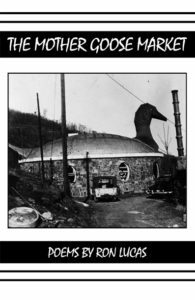 Rd Armstrong‘s Lummox Press isn’t merely surviving, it’s forging ahead with a vengeance—with books like THE MOTHER GOOSE MARKET by Ron Lucas, Lummox Press continues to put out books of essential poetry. And by “essential poetry,” I mean you need to buy this book—you can thank me later. This entry was posted in 2017, Book, Merchandise and tagged abuse, americana, Indiana Poetry, mental health, Ron Lucas, senior poetry on March 23, 2017 by bookdog.